Want to keep up with what new creations become available for loan for your photo shoots? Sign up for my mask photographer’s mailing list here. Are you a mask photographer looking to add interesting photography of masks to your portfolio? I’d love to work with you! 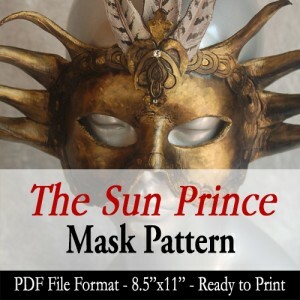 I will loan my masks to you for a photo shoot for free if you provide me with product photos that I can use for my business and galleries in return for free. You might also be able to acquire a mask from my inventory or a custom mask in exchange for print rights, which is a completely optional agreement we can negotiate separately. We will both sign a contract stating that if the masks are damaged in any way or lost that the photographer is responsible for paying for the worth of the mask. The photographer will also be responsible for providing me with high res versions of the photos for my use in a timely fashion. Once we have the legalities out of the way, the fun begins! The photographer has full control of how to direct their photo shoots. You are not required to have any input from me, unless you request it, giving you full creative control of what you’d like to add to your portfolio. The photographer keeps full copyrights to their work! I am only granted free use of these photos to promote my business and products. I appreciate a credit to my work as the provider of the mask when displaying your photos. You can do this by crediting ‘Angela R. Sasser of Angelic Artisan’ linking the words Angelic Artisan with the website url www.angelicartisan.com or you can simply feature the website link by itself, if space is short. The most important thing to be included when crediting me is the url. I will be sure to do the same and credit you where I display your photos as well! If you are interested, e-mail me for details.